This printing technology meets the green printing standards necessary for many projects today and is a welcome addition to the printing world to help protect our environment for the future. 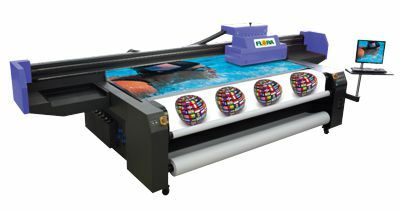 The Flora Wide Format UV Flatbed Printer has capacity for up to a 4' x 8' material printing, which enables us to print large sign panels or multiple sign panels at one time, saving time and money. This machine is very efficient for printing multiple quantities of signs. Some of the most popular signs we print using the Flora are Real Estate Aluminum Panels, Point of Purchase Displays, Yard Signs, Trade Show Displays and Large Format Wall Board Prints. The biggest advantage of the Flora is its ability to print direct to rigid, flat materials such as aluminum, wood, coroplast (plastic cardboard), foam board, acrylic, PVC and other flat materials.